italian food | Best Road Trip Ever! Luigi’s is an Akron institution which features a giant pizza made by PR “Grizzled Wizard” Miller on the outside. 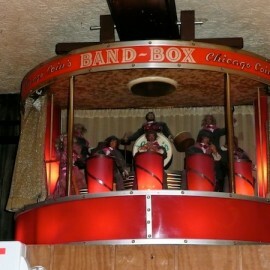 Luigi’s is also known for a 1949 Mechanical Bandbox above the front door that comes to life when the jukebox is played.